Home Gotta Getta GUND GUND Baby Gund My First Teddy™ Pink 24"
24", 2009, Soft pink plush, polyester filling, embroidered eyes and nose, satin foot pads with "My First Teddy" embroidered on left foot pad. Machine wash cold gentle cycle, air dry. Non jointed. 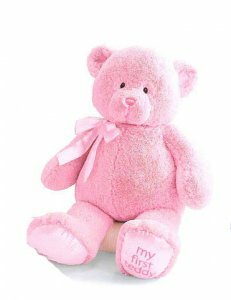 Notify me of updates to Gund My First Teddy™ Pink 24"